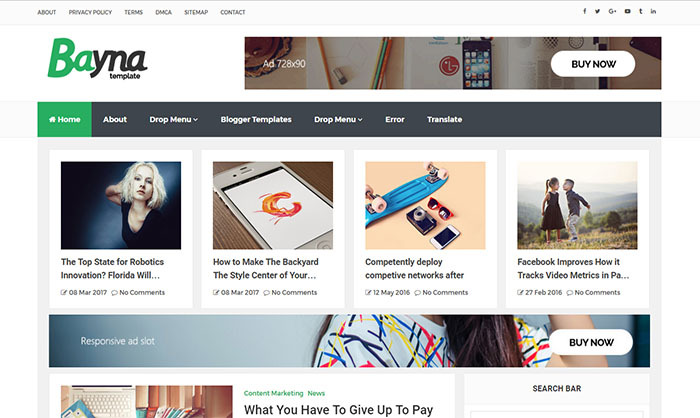 Bayna Blogger Template is a high quality and professional blog style theme. This is perfect for review blog, technology blog and any type of community blog. Bayna is a professional blogger template. This is 100% scored Search Engine Optimized and responsive template for you. If you’re looking for one unique, responsive and clean design theme then this is ideal choice for your blog. If you own Magazine, Technology, News or Review sites then this is one of the best choice for your blog. You can also setup this theme by simply using drag and drop options.